I recently had the opportunity to screen Glenn Douglas Packard’s feature film debut, the slasher Pitchfork — a film that has been generating a great deal of buzz and winning numerous awards on the festival circuit. Slasher films are making a comeback in a big way, and I for one couldn’t be happier about that. It’s great to see so many filmmakers embracing the playful campiness, the over-the-top gore, and the undeniable sexiness that helped fuel the slasher craze of the 70s and 80s. Of course, as with any popular trend, there’s a lot more junk floating around than actual gems. So I approach any viewing with cautious optimism and low expectations. Fortunately, PITCHFORK was one of those rare films that actually stood out from the pack and was a genuine joy to watch. While not without its flaws, it was an impressive debut effort that made me hungry to see more from both this filmmaker and this series. 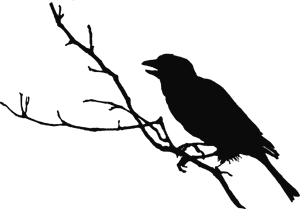 The first thing I noticed about PITCHFORK is just how damn good it looks. This is theatrical quality production, and it significantly enhanced my enjoyment of the film. I was hooked from the opening frames, basking in that gorgeous cinematography and those sweeping overhead tracking shots, coupled with that haunting melody that gets called back to for great effect towards the end of the film. It’s rare to see such high production values in a low budget film, especially a throwback slasher homage. The film follows a ragtag group of young performers and friends from New York, on a road trip to visit the family of their friend Hunter (Brian Raetz). Even though Hunter is now living in the big city and spending his time with a diverse and multi-cultural group of friends, his roots are on a small town Michigan farm where his family still resides. Hunter has recently come out as gay (breaking the news to his family over the phone), something his “traditional values” father (Derek Reynolds) is having a hard time coming to terms with. Hunter has returned to the farm to try to confront his father, while his friends have tagged along for moral support and a little fresh air and fun. As if things weren’t complicated enough, something far more sinister has descended upon the farm, putting Hunter and his friends and family in mortal danger. Packard is undeniably a horror fan, and there are numerous unapologetic references to other slashers throughout the film. While that may irk some viewers, the references are not subtle and clearly meant to serve as homage rather than rip-off. There’s a brief but memorable scene that seems to deliberately reference ‘Freddy vs Jason’, and it is pure greatness. You’ll know it when you see it! Although Packard pays a great deal of loving tribute to previous slashers, there’s plenty here that is refreshingly unique and memorable. While it’s a bit heavy handed in its social commentary, I appreciated that Packard tried (and mostly succeeded) to create an interesting and unique story with diverse and relatable characters and a real sense of depth and conflict (outside of the obvious masked maniac trying to kill everyone). The entire cast handles the material reasonably well, with a few standout performances. There’s a barn dance scene in the beginning, which is rather silly… but also undeniably entertaining. It’s impressively choreographed (not surprising given Packard’s extensive dancer/choreographer background), and it’s brilliant in its cheesy glory — adding the perfect amount of lighthearted levity to the horror mix. Then there’s the titular character himself, Pitchfork, a terrifying but empathetic killer. Visually striking, lean and muscular, this shirtless madman wears an animal mask and has a pitchfork for a hand. He’s highly reminiscent of other slasher favorites, but unique enough to stand apart from other masked killers. Much like other iconic boogeymen, such as Jason Voorhees and Michael Myers, he never says a word. Unlike those killing machines, however, he is very much human with a backstory that hints at extensive physical and emotional abuse. 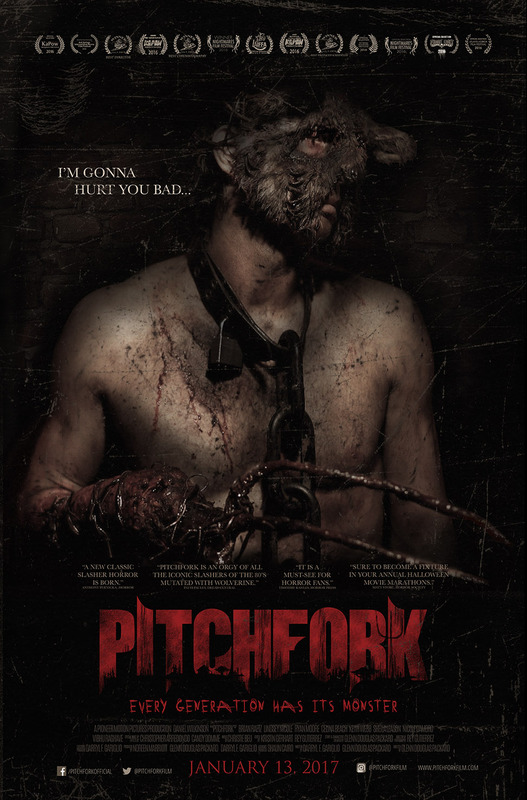 Daniel Wilkinson as Pitchfork is exceptional. With no dialogue, he communicates volumes with his animalistic grunts and body language, showing a surprising range as his character swings wildly from exuberant man-child to violent and menacing murderer. In the interest of being fair and balanced, let me say this. Like the vast majority of films in this subgenre, there are giant plot holes. Characters often make dumb decisions just to set up the next great kill. Much of what happens makes little to no sense. It’s a bit uneven in tone and pace. If you’re a rabid fan of the subgenre, none of the above is likely to cause you much concern. But more discriminating horror fans may not be able to forgive the slasher clichés this film so lovingly embraces. The ending of PITCHFORK is a bit of an enigmatic cliffhanger, which may frustrate some. It definitely seems to be teasing the very real possibility of a sequel. In fact, Packard has stated that he envisions PITCHFORK as part of a trilogy, with both a sequel and a prequel to come. That would explain a lot about the amount of mystery he maintains throughout this film. We get precious little information about the killer, his motivation, or his backstory. The final scenes offer some illumination, but the viewer is left hungry for much more. Hopefully, Packard plans to satiate us soon. Pitchfork is available on demand beginning January 13th from Uncork’d Entertainment. Check out the trailers below and, if you’re a fan of slashers and looking for a bloody good time, we encourage you to seek this one out. You won’t be disappointed!